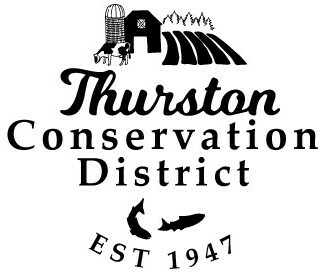 Thurston Conservation District is currently hiring for two positions. This position is responsible for managing the Thurston CD’s technical staff department, grant writing and fund development, conservation project management and implementation, oversight of all implementation and cost share projects, designing and/or collaboration with engineers to develop project designs, and overseeing deliverable tracking and reporting. This position will also focus on coordinating Thurston CD’s involvement in the Chehalis Basin Strategy, including the Early Action Reach Design process, and facilitating the Thurston Shore Friendly program. Experience in engineering and design, construction project management, stream and shoreline habitat restoration, cost share implementation, staff management, grant management, and stakeholder engagement is required. This position also oversees project implementation and provides mentorship to Thurston CD’s technical team, and maintains frequent two-way communication with the Executive Director. See full job description and application instructions here. This position is responsible for working with farmers in Thurston County in planning and applying natural resource conservation practices using State Natural Resource Conservation Service of Washington conservation practices, developing conservation plans, and coordinating the Voluntary Stewardship Program (VSP) and the development of Individual Stewardship Plans (ISPs). A primary focus will be dedicated to farm planning (including dairy nutrient management plans) and ISP development. This position will provide technical assistance to landowners and implementation of cost share projects. Additional experience in water quality monitoring and stream habitat restoration is helpful. This position coordinates and implements other field projects as assigned by the Conservation Program Manager. This position may occasionally supervise other volunteers, interns, work crews, project contractors, and technical staff on specific projects. We sincerely thank you for your interest in joining the work we do at Thurston Conservation District!